126 p., 15,5 x 23,0 cm. With contributions by Tilman Borsche, Günter Figal, Hermann Lübbe, Hans Julius Schneider, Pirmin Stekeler-Weithofer and Holm Tetens. Was ist Philosophie? What is philosophy? This is a question feared by philosophers, especially when laypersons wish to have an answer. The question forces us to replace supposedly professional arguments with a critical look at an overall project, and this is what really gives the professional discussion its meaning. 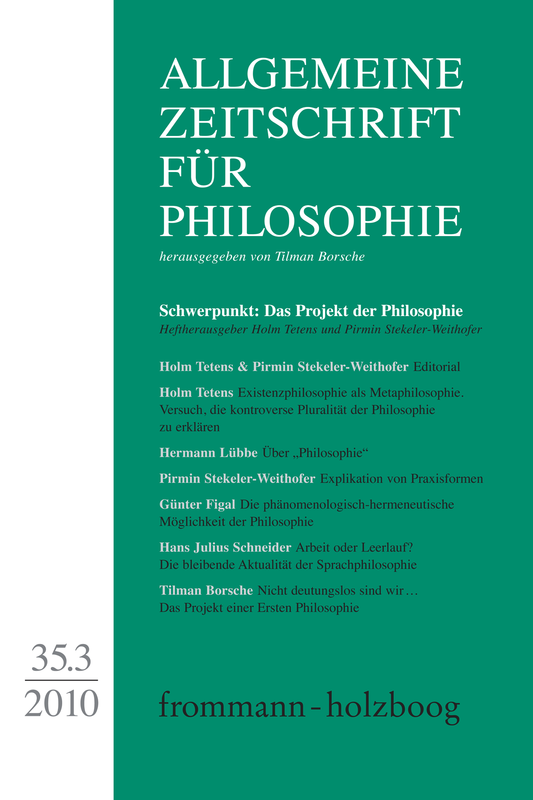 Inspired by a lecture held by Holm Tetens, the Allgemeine Zeitschrift für Philosophie (General Journal of Philosophy) asked well-known representatives of the discipline to give their understanding of the project of philosophy. The main concern was not to compel the notoriously divided guild, who literally subsist on arguments, to reach a minimum consensus. Thus the answers may be (and will be) controversial. This applies even in those cases where what they are saying is self-evident, for example that philosophy’s main business is not just any »proof« or »refutations« of philosophical theses, positions and ideologies but rather to organize self-evident requirements of human knowledge, actions and life in certain levels of relevance so explicitly that even the educated layperson can understand the significance of these attempts to create order. Controversial plurality was an obvious and permanent feature of philosophy from its beginning. How can controversial plurality in philosophy be explained? This paper offers an explanation in two steps. First: How can self-reflective human beings been grasped as part of reality? This question should be understood as the central problem in philosophy, a kind of philosophical »leitmotiv«. Second: Existential philosophy has analyzed the unsolvable conflicts in human life. The controversial answers philosophers offer to the central problem in philosophy mirror these conflicts, this »contradictory position« human beings hold in the world. Instead of suggesting any »project of philosophy«, this article begins with an account of the actual relevance ascribed to philosophy in many places in modern European culture. If we imagine the sum of the results of all the sciences and academic disciplines under the title of an integrated »world view«, represented in an ideal map of the entire world, the place of philosophy would be in the margin where the keys are given for the symbols used in the map. The knowledge implied in the system of the symbols used in a map is the a priori condition for the generation of the empirical knowledge represented in the actual configuration of the map. Whenever knowledge is applied it will lead to an increasing demand for further knowledge as well as for philosophical reflection. Thus the evolution of modern sciences, technologies and other forms of socially relevant knowledge as well as the increasing complexity of modern society lead to a growing demand for philosophers. By combining the insights of Plato, Aristotle, Kant, Hegel, and Wittgenstein we can see that the real topic of philosophical reflection are ›forms‹, not as transcendent or utopian ideas but as forms of performances (Vollzugsformen). The basis of any knowledge, especially about forms, is practical knowledge, some know-how to reproduce and recognize forms. As such, knowledge always is a ›rational faculty‹ or ›competence‹. The phenomenological possibility of philosophy arises with the attempt to understand something without any prejudice, by describing it in an unbiased way so that it can show itself as it is. There is no other way for philosophy to realize itself but in the reflective development of this quest for a thing in itself. Philosophical descriptions concern the concept of a thing by conceptually expounding the thing such that it can be seen in its own structure through the conceptual framework of its description. Philosophical description is not the same as interpretation; the method of description is to be distinguished from the hermeneutical. However, the experience of interpreting texts can serve as a model exemplifying some crucial aspects of the phenomenological method of philosophy, like a text will incessantly require new interpretations. And – due to the plurality and irreducible perspectivity of its descriptions – philosophical conceptualizations will always involve critical interpretations of other philosophical conceptions. The paper attempts to show that the reflection on language will remain decisive for pursuing philosophy in an epistemologically critical way. Advances in the sciences and ongoing social changes continually make it necessary for us to tell sense from nonsense, to see in which cases language works properly and in which it seems to run more like an idling engine (or, as Wittgenstein put it, in which cases language‚ goes on holiday‘). A prominent case for this need became visible recently, as some distinguished neuroscientists proposed legal consequences to be drawn from their research. A philosophy of language in the succession of Wittgenstein’s later work allows us to steer clear of two illusions: It can avoid both a vain effort to fix the realm of sense formally (in terms of an axiomatic-deductive theory of meaning) and an uncritical quietism that takes Wittgenstein’s dictum that »philosophy leaves everything as it is«, at face value and gives up any claims of epistemological relevance. Tilman Borsche: Das Projekt einer ersten Philosophie. From Aristotle to Descartes, philosophy never succeeded in fixing the first principles of human thinking. Nevertheless, in the sciences as well as in public discourse, we keep asking for a universal set of ontological and epistemological fundamentals. It seems we cannot do without asking for a comprehensive view of the universe of discourse as well as of its objects. But we are lacking an unquestionable starting point. What could that be but a word expressing a concept, an idea? Yet the meanings of words are contingent, inevitably open to further questioning. Prima philosophia thus turns out as the ever renewed attempt to explicate the universe of thought and its objects in terms adjusted to the conventional evidences of time and place. 20th century philosophy took its basic critical inspirations from the concept of language. This article in its second part develops the conjecture that for some reason the concept of culture is about to take over the crucial function of providing a basic orientation for philosophical thinking.